Your Spiritual Well-Being is one of the most important aspects of your life as it affects your mood, personality, and the way you interact with others. 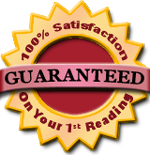 I strive to help my clients live happy, healthy lives, which includes your Spiritual Well-Being. Read on to find out how candles, meditation, crystals, and gem stones can all help you achieve a well-balanced, healthy, spiritual sense of inner peace and tranquility. Using candles for meditation allows you to remove negative energy that surrounds you and to connect with the spiritual world. People typically use music, air, or other objects to focus their mind during meditation. Candles are used as a medium or a tool to focus the mind. Being able to focus on the candle flame helps make it easier for people to concentrate and keep their focus during meditation. Since the candle's flame is something real and influenced by nature, it makes a perfect focal point for deep meditation. Meditation makes people able to hone their sensitivity and get in touch with their innermost thoughts. Meditation candles also help the healing process for many people who are experiencing stress, insomnia, or mental problems such as low self-esteem and shame. Meditation by candle flame will be able to help open the door of the heart of life because meditation teaches us to see not with eyes but with the heart. Meditation candles do not require people to empty their minds to concentrate, but only to focus their thoughts on the candle flame and relax their mind. Candles are a vital tool when connecting with the spiritual world. They are used in many of my readings and meditation. I am often asked about meditation. How does it work? Why should I do it? What could I gain by meditating everyday? What is meditating? Meditation is any act where you can close the doors to this world and open the doors to your soul. You can be washing the dishes or sweeping the floor and be meditating. It is a state of mindlessness where you stop thinking, and you start receiving messages from your heart...from your soul. 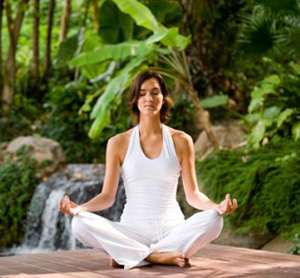 The preferable posture for meditation would be in a sitting down position. Comfortable, but not too comfortable because you might fall asleep. It is important that the back stay erect so that the energy may flow from the top of your head straight down. The next step is to focus on your breathing. Focusing on your breathing allows you to let go of your thoughts. The hardest part of meditation is letting go of the thousands of thoughts that fill your mind. If you can, imagine each thought as a leaf and your mind a river. Allow each thought to flow away, as the river continues to run. Don’t resist the thoughts or entertain them, because they will only get stronger or lead to more thoughts. Take a deep breath and let them pass, until you have reached a state of emptiness and thoughtlessness. This may take several meditation sessions for you to accomplish, but be patient with yourself. For so many years you have allowed your mind to chatter endlessly without restraint or control, and now that you are trying to control it, it will be resistant. Let your soul take charge, bit by bit, with each meditation session. Once you have accomplished the ability to turn your mind “off” during your mediation sessions, it is now time to commune with your Creator. Meditation is the tool given to us to carry an inner conversation with our Source. It becomes hard for the Universe to communicate with us when our minds are constantly thinking. We must learn how to “connect” with our soul through meditation, in order to receive the messages needed to overcome the obstacles in our life. Many times we receive amazing intuitions about where our life is headed or what we need to do to improve our life. Sometimes we receive insights into our problems that help us find solutions to them. Other times we experience a glimpse of an invention or an artistic creation that blows our imagination, and we begin to do what we can to manifest this glimpse. Where did all of these intuitions come from? They came when our mind was silent. They came when our soul was open and willing to receive them. Meditation creates a clear channel of communication between our souls and God, and this channel is what gives us life, peace, and love. It is the source of everything we need. Every single soul on this earth was born with the innate ability to meditate and receive all that the Universe intends for them. But how many people really use this powerful tool? Many times we are so bogged down by the forces of this world that we forget to take time and commune with our Creator. Yes, prayer is great, but most of the time it is a state of mind that is asking of God. Meditation is a state of mind that is listening to God and asking what He wants from us instead of what we want from Him. One must be resilient and strong against the many distractions and temptations that pull us away from trying to meditate. Meditation is the key to the Kingdom of Heaven... a Heaven that can be experienced only in the present moment. A Heaven that is reachable, but takes discipline and determination to reach. Take time to develop an honest and sincere relationship with your Creator. Find ways to incorporate meditation into your daily life. Use the tool of meditation to conquer your anxieties and worries. Release yourself from the lies of this world and the burdens that you carry. Use meditation as the tool to find out who you are and where you come from, and if at first you don’t succeed... try, and try again. For there is nothing in this world that will give you the peace that your Creator will give you once you take the time to commune with Him. All gemstones have one thing in common: they originate from the hot magma which makes up the center of the Earth. Thousands of years cooling, gradual movement and displacement have formed stones, rocks, and mountains. This continuous process of geologic change causes rocks and minerals of various kinds to form. They are made from dust, sand, chemical substances, and acids that have dissolved in water. Humans have always been fascinated by gemstones. 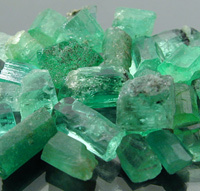 The therapeutic use of gems is not a new or even an alternative healing method. Evidence exists showing that ancient civilizations used gemstones to heal diseases. Gems were considered to have protective and talismanic properties that keep evil spirits at bay. Shamans and medicine men utilized the power of crystals in rituals and ceremonies. This ancient knowledge has been passed on generation after generation. The earliest reports of gems' healing properties date back to the fourth millennium before Christ. They can be found in Sumerian writings. 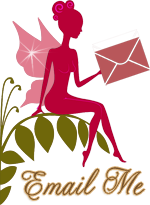 There are details on how to prepare elixirs, pastes, and powders from gemstones. Doctors in India place colored gemstones on the painful part of their patients' bodies and to enhance their healing power, use them as channels for the light and warmth of the sun. 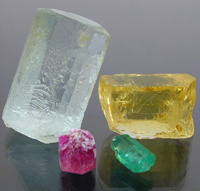 Further evidence of the significance attributed to gemstones can be found in the many references to them in the Bible. They serve as symbols for health and godliness. The twelve tribes of Israel are represented by 12 corresponding precious stones placed in the breastplate of Israel's high priest. The stones are arranged in four rows of three stones. According to later tradition, they possessed extraordinary powers. In John's vision of the New Jerusalem in Revelation, the heavenly city is built from gemstones. The number twelve was a sign of the highest harmony and perfection. 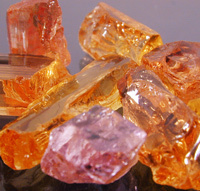 The strength of the gemstones were attributed to the power of God. The twelve walls of Jerusalem, there were twelve apostles, and twelve zodiac signs all with corresponding gems. 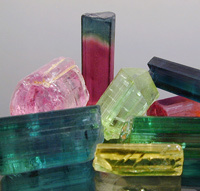 Each gem possessed its own unique qualities. 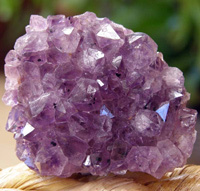 Every advanced, ancient civilization knew of the healing properties of crystals and stones. The Sumerians carried gems in leather pouches. Others wore talismans and amulets or distilled the stones into powders and elixirs. Regardless of their method, many civilizations knew that keeping stones close to their person would heal, strengthen, and protect them from evil spirits, sickness, and disaster. The Greek philosopher Aristotle spoke of the power of healing stones. The Romans carried cut stones with them to ward off sickness and bad luck. The Egyptians wore amulets made of amethyst, hematite, jasper, carnelian, or lapis lazuli. Often the stones were polished or hammered into scarabs,which were symbols of creation and accompanied the dead to protect them in the next life.